Continuing the winter roast kick featuring Marcella Hazan. This delicious Lombard recipe featuring lamb shoulder and juniper berries. 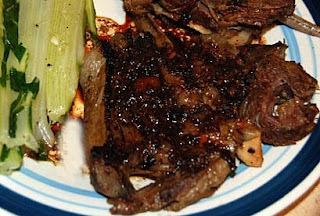 Recipe is simple: roast 2.5 lbs of lamb shoulder (bone in, 3/4" slices) with carrot, celery, and onion (2 part onion to 1 part the carrot/celery), 2 garlic cloves smashed (not chopped), 2 teaspoons of juniper berries (lightly crushed), 1 cup of white wine. Put it in a dutch oven or heavy pot, cook for 2 hours on medium low heat with lid on, turning the meat every 30 minutes. At this point my meat was done so I pulled it, and deglazed the pan with red wine. This turned into a fantastic sauce, the red mixing with the blackened lamb bits and the juniper. Marcella instructs to cook another 1.5 hours with lid askew, but my meat was already finished at the end of the second hour. She makes no mention of the red wine reduction, but I'm sure she wouldn't mind. Maria Hazan's roast lamb with juniper berries was one of the first dishes I ever cooked when I first moved out of home and started cooking for myself. It was also one of the most memorable - probably one of the best things I've ever cooked and this was 25 years ago. I sometimes wonder why more people don't cook with juniper berries.